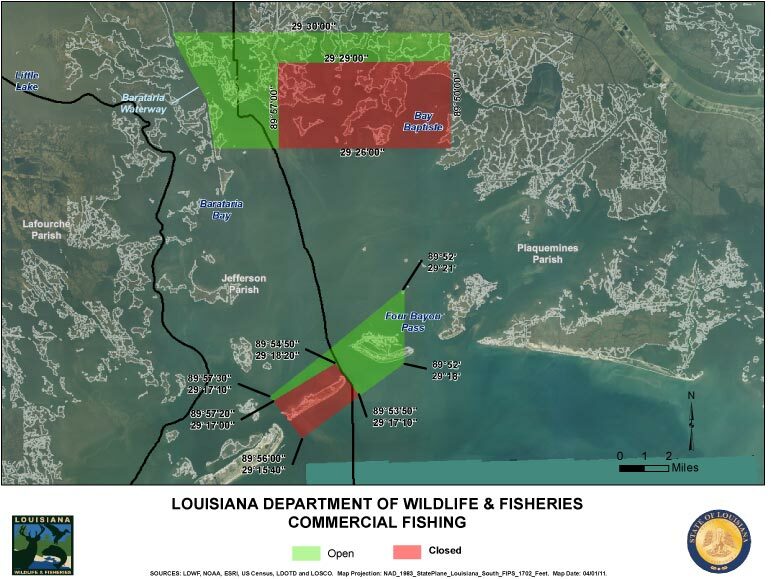 The Louisiana Department of Wildlife and Fisheries, in coordination with the U.S. Food and Drug Administration and the National Oceanic and Atmospheric Administration, ordered an emergency reopening of recreational and commercial fishing in portions of state inside and outside waters within the Barataria Basin that were previously closed due to impacts from the Deepwater Horizon Oil Spill last year. These areas were opened previously to only recreational and charter boat angling. "By working so closely with our state and federal partners we can continue to ensure consumers of Louisiana seafood that it is safe," said LDWF Secretary Robert Barham. "Today we are one step closer to resuming normal fishing practices." Secretary Barham ordered this opening following the completion of comprehensive testing, after which the FDA advised that shrimp, crab and finfish tissue samples tested from these previously closed areas are safe for consumption. Recreational and commercial fishing reopens immediately in certain portions of state inside waters adjacent to Grand Terre Island, Four Bayou Pass and the Barataria Waterway. This reopening does not include the harvest of species closed by season, including shrimp and certain finfish. Furthermore, this opening does not include the commercial harvest of oysters, as this activity is regulated by Louisiana Department of Health and Hospitals. The Department of Wildlife and Fisheries is charged with managing and protecting Louisiana's abundant natural resources. For more information, visit us at www.wlf.louisiana.gov on Facebook or follow us on Twitter @LDWF. For more news on the Gulf Coast oil spill, click here.